There were two new reports on the economy worth mentioning this morning. First, data from the Bureau of Economic Analysis (BEA) showed that U.S. gross domestic product (GDP) grew in the first quarter of 2017 by more than previously estimated. 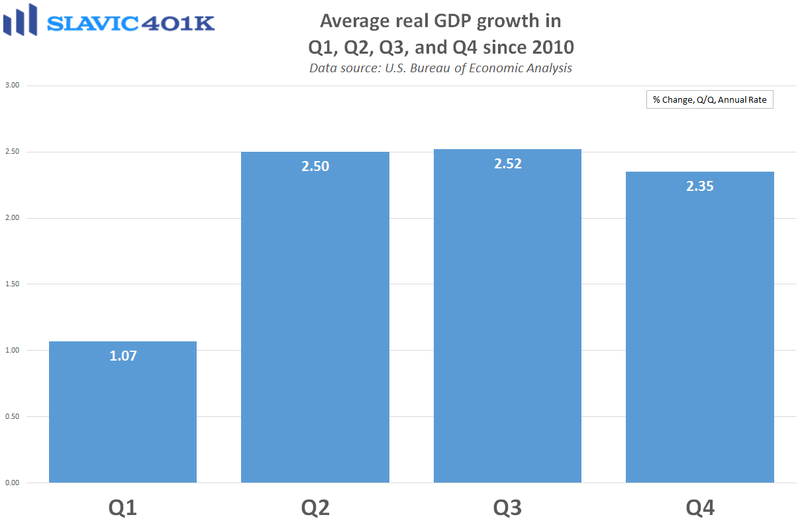 Specifically, real GDP, which measures the value of the production of goods and services in America adjusted for price changes (inflation), increased at an annual rate of 1.2 percent in Q1. That was up markedly from the initial (advance) 0.7 percent estimate, and a better upward-revision than economists had expected. Much of the improvement was due to business investment, which was already strong in the early estimate but shown to be even better after the adjustments. For example, nonresidential fixed investment, i.e. 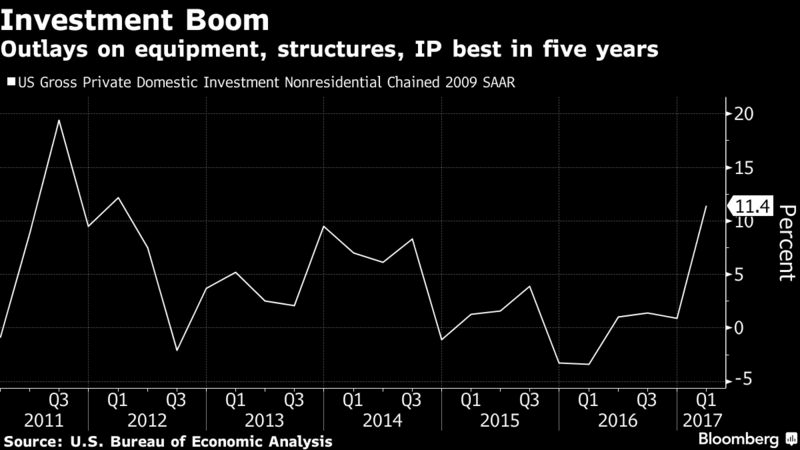 spending on equipment, structures, and intellectual property, rose at an 11.4 percent annualized pace in Q1, a five-year high and well above the initial 9.4 percent estimate. Altogether, it was encouraging to see that U.S. economic growth during the first quarter of 2017 was not as terrible as initially estimated. 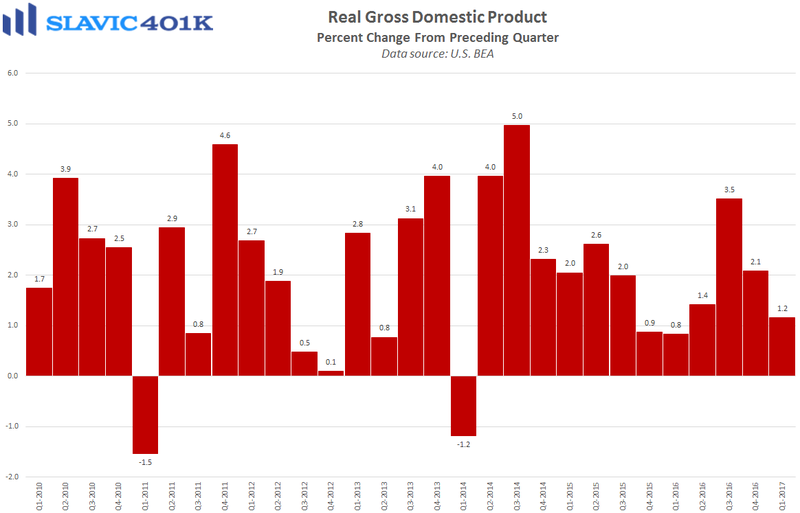 However, the 1.2 percent pace of expansion was still relatively weak and maintained the recent pattern of Q1 sluggishness (second chart below). 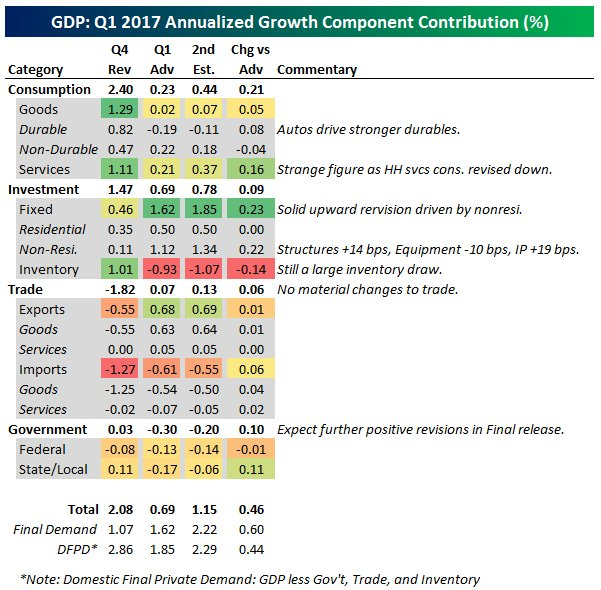 Looking ahead, though, analysts expect GDP growth to accelerate substantially in the second quarter of 2017, with forecasts currently ranging from +2.2% to +3.7%. 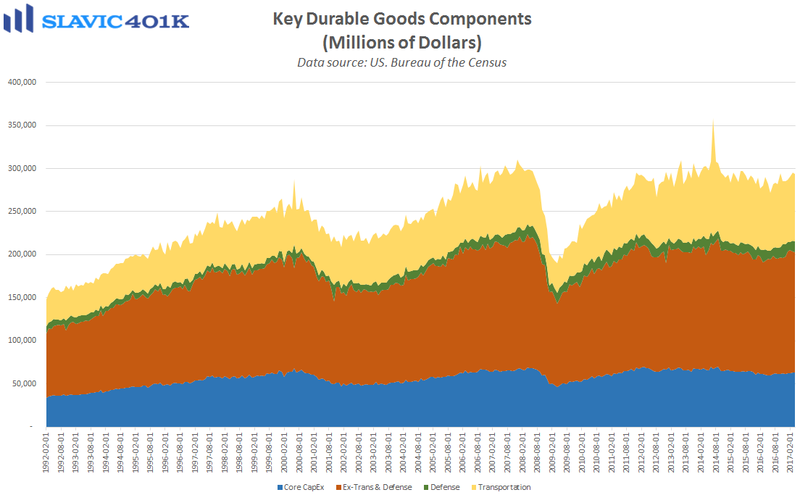 Elsewhere, a report from the Census Bureau showed that new orders for U.S.-manufactured durable goods (items meant to last at least three years) fell in April by $1.6 billion (0.7 percent) to $231.2 billion. That was the first monthly decline of 2017 but not quite as bad as economists had anticipated. 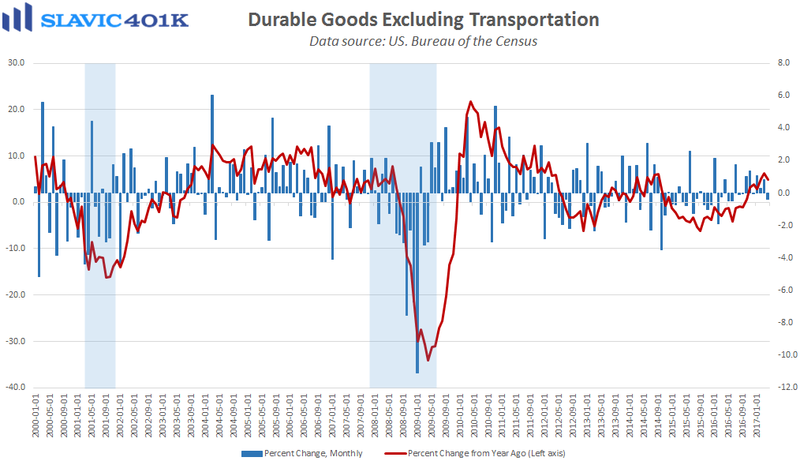 “Core” durable goods orders, which exclude the volatile transportation component, also fell in April (-0.4 percent), significantly worse than the 0.4 percent gain that was expected. Orders for nondefense capital goods excluding aircraft, i.e. 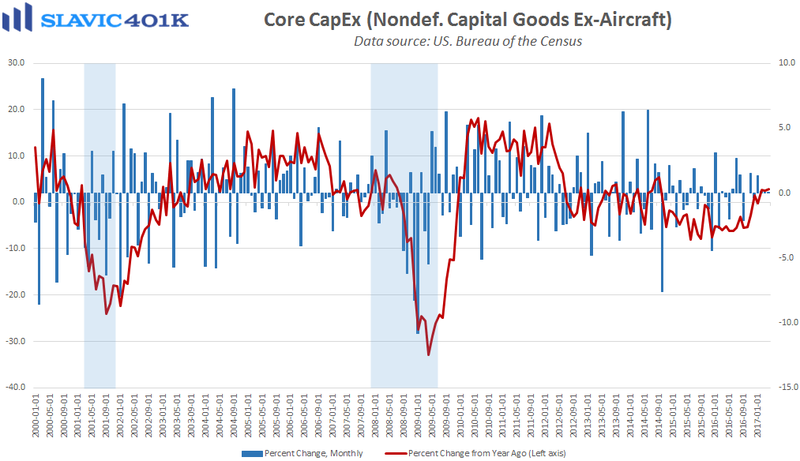 core capital expenditures, an important proxy for U.S. business investment, were flat in April, again worse than forecast. While there were a few upward revisions to earlier data, this was overall a disappointing report that could cause some analysts to lower their projections for U.S. GDP growth in the second quarter. In fact, Goldman Sachs cut its Q2 GDP forecast from +2.8 percent to +2.6 percent immediately after this data release, citing the softer-than-expected capital goods figures. 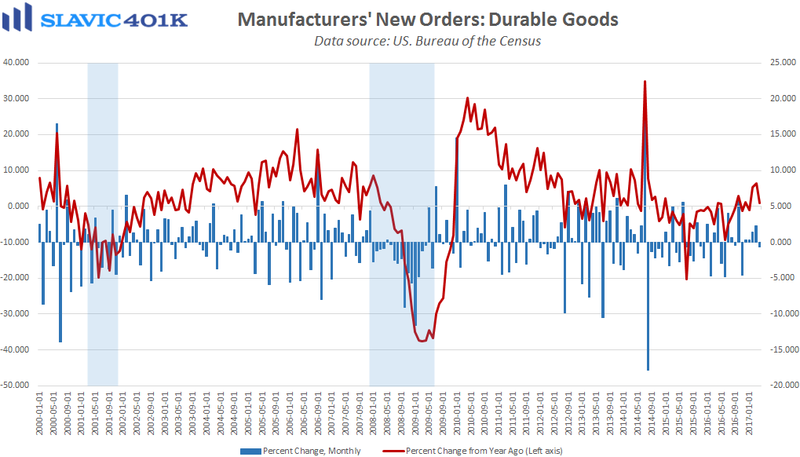 Further, the weak durable goods data could also signal that companies have recently become reluctant to proceed with expansion plans until D.C. lawmakers finally make progress on tax reform and infrastructure investment.